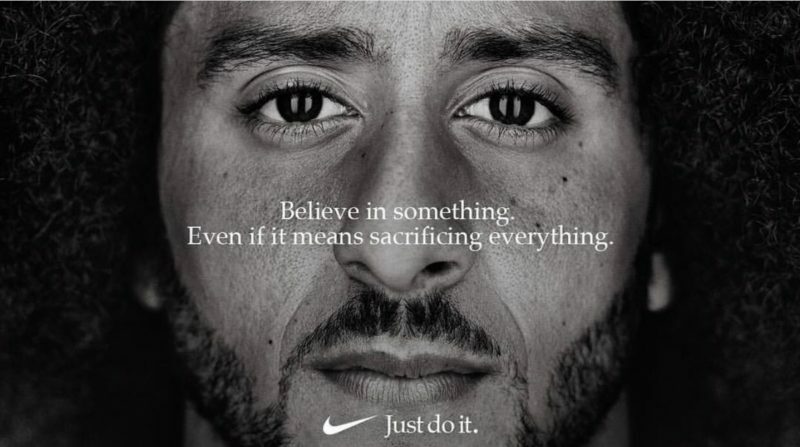 Before Kaepernick was revealed as the face of Nike’s campaign, only two percent of Americans reported hearing something negative about Nike. After the launch, that jumped to 33 percent. As the negative buzz set in, consumer sentiment followed, with favorability and purchasing consideration dropping. Calls for boycotts have drawn heavy media attention, and Morning Consult’s data suggests they may be more than empty threats. 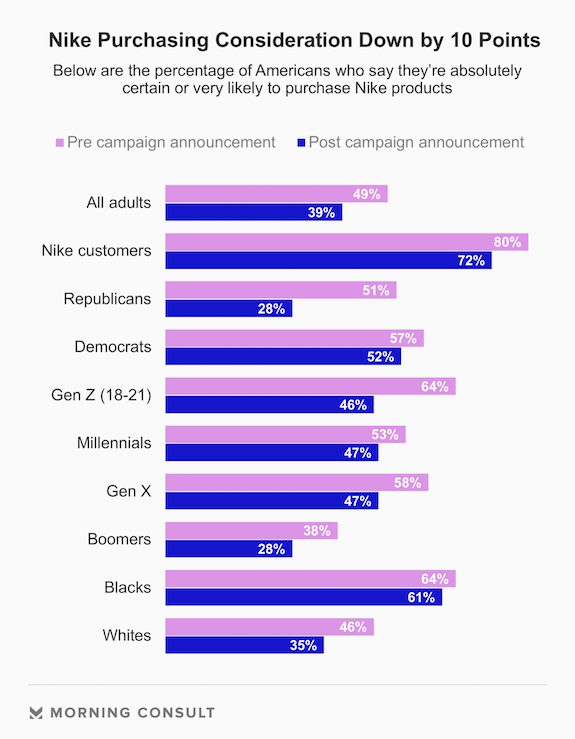 Among Republicans, those likely to purchase Nike goods dropped from 51 percent to 28 percent. In addition to the brand tracking data detailed above, Morning Consult ran a nationally-representative poll specifically about the campaign ad to gauge awareness of the campaign and how it is affecting the company’s brand. 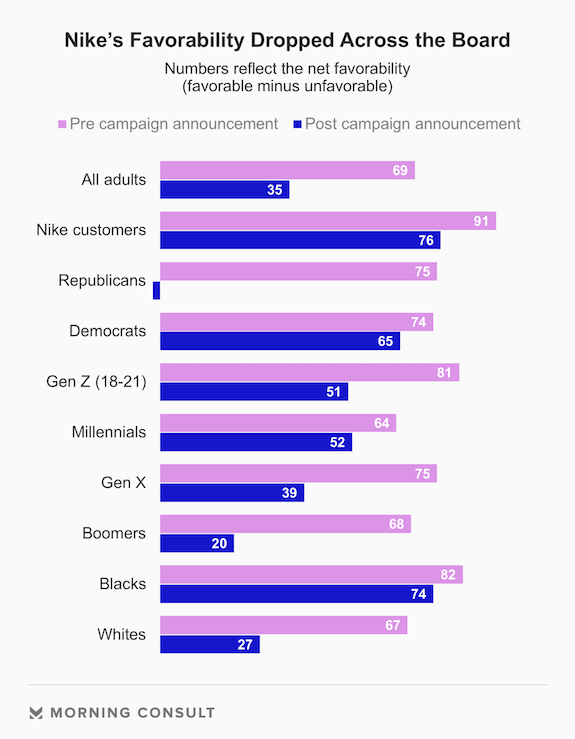 The survey finds that Nike’s campaign made immediate waves, with 61 percent of respondents saying they had heard a lot or some news about it. Americans are split on how appropriate the ad campaign is, as 39 percent of consumers said it was appropriate to make him the face of their campaign, while 38 percent said inappropriate. Fifty percent of those who said they wear Nike at least once a month support the decision, compared with 30 percent who do not. 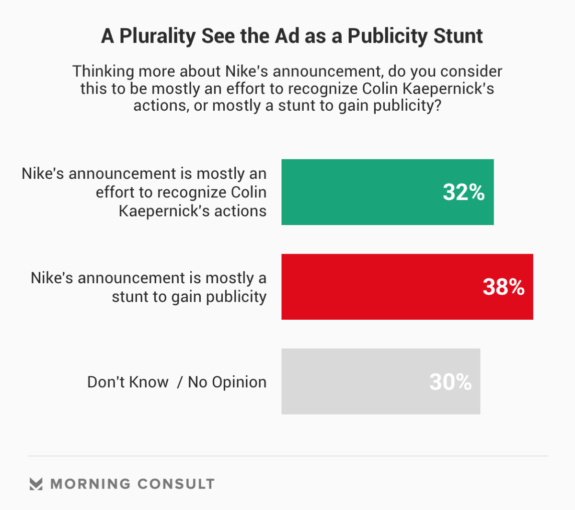 Along with being split on the appropriateness of the campaign, there was also a divide on the question of whether or not Nike’s intentions were pure or if they just wanted publicity. 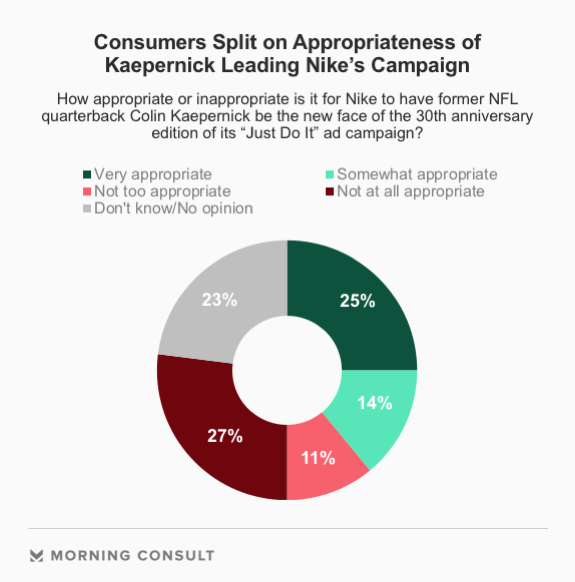 Ahead of the regular season kickoff game on September 6, when Nike plans to debut the Kaepernick ad, Morning Consult’s survey suggests that the impact of the ad on the NFL’s viewership will be minimal for now. 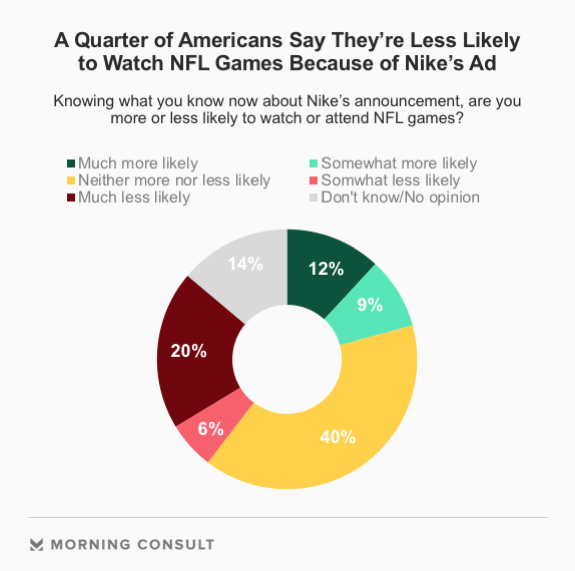 Forty percent of consumers said Nike’s announcement does not make them more or less likely to watch or attend NFL games — 21 percent said more likely and 26 percent said less likely (14 percent didn’t know). Morning Consult Brand Intelligence tracking data has previously shown that the perceptions of the league are damaged when the protests are in the news. For example, a report from late May revealed that the league’s announcement of a rule meant to curb protesting caused an immediate backlash, even among Trump voters. Over the last month of tracking, the NFL’s net favorability stands at +20, up from a low of +9 in November of 2017. However, the league has yet to fully recover from the initial blowback to the anthem-kneeling: In the spring and summer of 2017, the NFL’s net favorability was consistently in the mid to high 40s. This exclusive report contains survey results from Morning Consult Intelligence, the company’s brand management platform, and a nationally representative custom survey. In the Morning Consult Intelligence data, Morning Consult interviewed 1,694 adults (“pre news”) in the U.S. from August 26, 2018 to September 3, 2018 and 5,481 adults (“post news”) from September 4-5, 2018. The interviews were conducted online and the data were weighted to approximate a target sample of adults based on age, race/ethnicity, gender, educational attainment, and region. Results from the “pre news” survey have a margin of error of plus or minus 2 percentage points, and results from the “post news” survey have a margin of error of plus or minus 1 percentage points. In the custom national survey, Morning Consult interviewed 1,168 adults from September 4-5, 2018. The interviews were conducted online and the data were weighted to approximate a target sample of adults based on age, race/ethnicity, gender, educational attainment, and region. Results from the full survey have a margin of error of plus or minus 3 percentage points. Morning Consult Brand Intelligence tracks 2,000 brands on a daily basis. Request a demo to learn more about our brand tracking data.